The Iraqi Council of Ministers has approved a plan that foresees the establishement of three new provinces in Iraq – one of them the Nineveh Plain, which is currently hosting the largest population of Assyrians in Iraq. The decision to create a province in the Nineveh Plain came only two weeks after the Iraqi National Assembly recognised Assyrian as an official language. 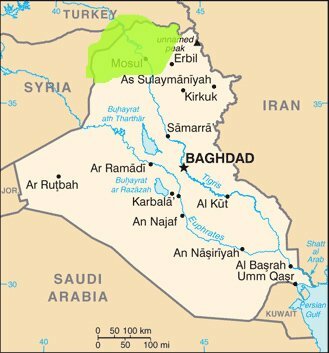 On January 21  the Iraq Council of Ministers approved a plan to establish three new provinces in Iraq. One province would be in Fallujah, in central Iraq; a second would be in north Iraq, in Tuz Khormato; the third would also be in north Iraq, in the Nineveh Plain bordering the Kurdish areas. The Nineveh Plain has the largest population of Assyrians (also known as Chaldeans and Syriacs) in Iraq. Sargon Slewa, the Minister of Environment and a member of the Iraqi Parliament and of the Assyrian Democratic Organization, one of the largest political parties that represents Assyrians and other Christians in Iraq, requested the establishment of a province in the Nineveh Plain, pursuant to a study of the needs of Christians, as outlined in Iraqi Cabinet meeting 54 in 2011. The Council of Ministers instructed the State Minister for Provincial Affairs to prepare a study of these projects and submit a report to the Council. AINA asked internationally renowned journalist and Middle Eastern Expert Nuri Kino to interview Sargon Slewa regarding this important development for Iraq’s beleaguered and besieged Assyrian Community. Nuri Kino: What have you accomplished with this legislation? Sargon Slewa: One of the main goals and reason for Assyrians to stay in Iraq is to have self administration. This legislation lays the foundation for achieving that goal. Nuri Kino: Can you tell us where in the process you are? Sargon Slewa: Recognizing the Nineveh Plain as province by the by the Council of Ministers. Nuri Kino: How many percent of the inhabitants of the plains are Assyrians-Syriac-Chaldeans? Sargon SlewaSargon Slewa: Almost 40 percent. But still it depends on the borders of the province and which districts will be included. Nuri Kino: Practically speaking, what does that mean? Will the Nineveh Plain have its own police force? Its own government? Its own budget? Sargon Slewa: The Ministry of Provincial Affairs will conduct studies and make preparations to establish this province, which would have whatever is needed in security, economy and government. Nuri Kino: What role will the Assyrians play? On what level was the decision made? The Iraqi government? The Parliament? Will there be a voting? Sargon Slewa: This decision was taken at the governmental level. There are special considerations for the Assyrians/Chaldeans/Syriacs. This decision was taken to insure the continued existence of our community in the region. There is much work to be done, but this was the main step and the most difficult hurdle. Nuri Kino: What does this mean for countries dealing with Iraq? Sargon Slewa: The international community must pay good attention to this issue, and in light of announcements to receive Christians refugees in Western countries. Nuri Kino: Tell me about your feelings. What are you feeling and thinking right now? Sargon Slewa: It is one of the greatest moments of my life. I feel like I want to sleep, like when you have finished an exhausting and satisfying task and you are tired and need a nap. Assyrians outside of Iraq greeted this news with cautious optimism. If implemented this could change the reality on the ground for Assyrians and put them in a position to have a say on their future in Iraq, hopefully reversing the emigration to the West. I am very glad the Iraqi Parliament decided this. The Arab and Kurdish political parties will get the chance to show the world they can realize an Iraq with different ethnicities and different religions. In no any other country in the Middle East is this realized; they have the opportunity to show the Assyrians in Iraq and in the Diaspora that they want and will respect national minorities by giving them the same rights as they have. The Arabs and Kurds can show the world that this can be achieved in the Middle East. I hope this will be the first step toward respect politically for the Assyrians in Iraq. What the Assyrians are asking is not something new or different from what the Kurds and Arabs already have. The rest of Iraq should not fear to allow the Christian Assyrians to have a self-administrative region in the Nineveh Plains. They contributed to Iraq’s great history and legacy enormously and this could give them the opportunity to do that again. The Iraqi Arabs and Kurds should realize that allowing the Assyrians to protect themselves and receive a part of Iraq’s budget would only prove that they, Kurds and Arabs, care for Iraq and its stability. We congratulate our people on this first step toward a practical solution for our people and their most difficult plight over the last 10 years in the form of the recognition of the Nineveh Plain province. We thank all of those who participated, whether publicly or privately, in making this dream come true. It is a very first step to be sure. But a very critical first step. We are grateful to all of our parties on the ground, both political and non-political, for their untiring efforts and advocacy. Let it be very clear that we in the Diaspora, in particular through the medium of the Nineveh Council of America and all of the organizations and individuals that support it, intend to give our full support to the positive growth of this province in the interest of our people and all of Iraq. Since 2004 Iraq’s Assyrians have experienced a low-grade genocide , with 73 churches bombed, hundreds killed and more than half the Assyrian population forced into exile in Syria, Jordan, Turkey and Lebanon. It is estimated that half of the Assyrians who were in Iraq in 2004 have fled the country . The decision to create a province in the Nineveh Plain comes on the heels of a decision, made two weeks ago by The Iraqi National Assembly to recognize Assyrian and Turkmen as official languages. Arabic and Kurdish are also official languages. This decision allows public and private schools at all levels to teach in Assyrian and any other officially recognized language. Government documents are required to be provided in Arabic and Kurdish only.The decision to make the Assyrian language official also instructs the Minister of Education to open literacy centers for teaching the Assyrian. The Ministry of Education has sent a letter to to the churches to urge people to register for the literacy programs. The government will pay students to attend classes twice a week and issue a certificate of completion. Many Assyrian observers say these steps are too little and too late. Given the drastic exodus of Assyrians from Iraq and the general mood of the Assyrians, who see no future in a country torn apart by Sunni-Shiite bloodletting and lack of economic opportunities, the Assyrians continue to leave. Recently the Chaldean Church said that six Assyrian families leave Iraq daily. For the first time in their history, there are more Assyrians living outside of Iraq. Observers also point out that many such decisions have been made in the past but never been implemented, and are adopting and wait and see attitude.